My little shop turns 4 today! What started out as a little hobby when I quit my design job to stay home and raise my girl, has flourished into so much more than I could ever have dreamed. The past four years has brought me so many great memories, friends and experiences all thanks to you guys and the grace of God. I don't deserve the support you guys give me but I'm so thankful you do. When I opened up my shop I hoped I'd sell a print or two. In 2014 I surpassed 3,000 sales. WHAT?! Not only that but I was asked to be a local maker for both west elm Tulsa and OKC! Never could I have imagined I'd be typing that out. I am humbled and honored that you guys choose to hang my designs in your spaces and can't say thank you enough for supporting my shop. I was thinking up a fun way to celebrate my shop's birthday and decided to have a giveaway. Over the years I get asked a lot of questions about what pens, paper, paint pen, etc. I use. I definitely have my favorites and you can read more about those on my "faqs and favorites" page. So to celebrate the big 4! I'm giving away a few of my favorite things to one winner! Think of it as a "design basics" kit. I'd include donuts but those don't ship well so I'll eat one for you. You're welcome. 1. Leave a comment telling me what you would like to see added to the shop. More cards, prints, notepads, mini cards, etc. 2. Get a second entry by sharing about the giveaway (however you choose, instagram, facebook, twitter, you're own blog, etc.) THEN come back here and leave another comment telling me where you shared. I'll randomly select a winner Friday, January 30th, 2015 at 12pm CST. In addition to the giveaway, TODAY ONLY, you can get any 8x10 print in my shop for only $12! No coupon code needed, prices have already been marked down. love your heart and love the mini cards in your shop! Thanks for sharing your favs! I would love to see more prints! But love everything in your shop! Thanks for the chance to win this awesome giveaway:). I love your prints! Maybe postcards?? I love everything you sell.. keep it coming! Hi Leslie! I gotta say I love notecards. Standard or mini size! Love your shop. You rock. I love your prints, so more of those is always good :) Notepads or journals would be really fun! I would love more recipe cards. I love to give them as gifts and the mason jars on them are adorable! All your work is great! Maybe weekly calendars with blank spots? Just an idea! Love your work, Lesley! More mini cards would be awesome! More prints! I Love your work! I think cards and notepads or notebooks would be great! 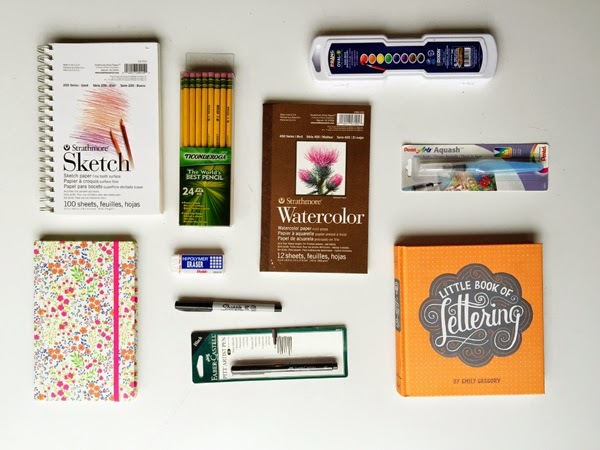 I'm so excited about this giveaway because you actually turned me on to handlettering and I'd love to be able to get all the supplies to really get started at it. You becoming a stay at home mom and making this your business sounds like a dream to me. Thank you for the inspiration. Would love to see more quotes- and postcards would be fun!!! I would love to see a Makers Gonna Make print..looking for one for my office space..but I also love notebooks of all sizes and shapes. I love that you have a backyard farm and would love to see more prints inspired by that. Love the garden one. Maybe you could do a chicken themed one? I would love to see garden and nature inspired verses! I LOVE all of your creations... but since one of my goals this year is to write more letters/notes (snail mail), I'd say cards! Congratulations on 4 years! I love your shop and already own two prints! I would like to see more prints with song lyrics (country, avett bros, etc)! You have the cutest prints and designs! I'd love to see a larger calendar fr hanging in the kitchen. Also, postcards and/or valentines would be adorable! =] happy birthday! Hmm..that's a hard question. I love your prints, but maybe more cards. I want to try and be better about having a stash on hand so I can send more snail mail to my friends. I would love to see another collab with the felt flower shop---the best of both worlds! I love everything! But maybe some journals or phone cases? Just make what your heart wants to create. I would love to see some Bible verse prints and more recipe cards! I have a set of your recipe cards and love to use them with gifts! I would love more prints! Postcards - they are less expensive to mail to family members than traditional cards and challenge me to be brief, yet thoughtful and descriptive, I my writing. I would love to see a set of notecards with your prints on the front. I love all your work so it is hard to suggest something. I would love it if you created a stationary set. you can rarely find those nowadays and they are my favorite! I would love to see little journals with your cover art on them!! Would love to see mini cards, but everything you do is awesome! Can't wait to see what the next 4 years hold for you & your beautiful family! Great giveaway! I love your prints! Oh gosh, whatever you do well be amazing. How about more journals/notepads? I love the mini prints that you make into calendars...so more mini prints! And more calendars! I would love to see more mini cards. I have found they are perfect to accompany the receipt of the person behind me at Starbucks when I pay for their order!! I would love to see more stationery. Shared on my IG @megan.gist. Thanks for offering the giveaway! I just adore everything in your shop!...but more cards would always be great!! I have been using a notebook with one of your prints as the cover for awhile and its almost full! More notebooks!! I mentioned you in an instagram: natography08!!!! I love cards! I don't know that I need to see more of them, but they're my faves. (-: congratulations on 4 years! yay! More prints, but I love it all! Hmm... I can't really think of anything to add... Maybe your designs on a small scale - like for refrigerator magnets? Or in 4x6 or 3x4 flat card sizes for Project Life albums? Posted on Instagram as well!! I think the above comment about making little mini cards would be so cute! I work at Anthro and we have these cute little cards (about the size of a business card) that say "you are awesome" or something like that. They would also be so fun to have Bible verses on! I think I'd love to see more cards, but I love everything in your shop! I would love to see little cards of encouragement! Oooo, notepads! I'm not sure if this is an option, but I'd love a spiral journal (lined or unlined) with one of your designs on the front. When I think about adding new items to my shop, I think about what I would love. When I think of you, I think GARDENING ADVENTURE!! Keep making items that help new gardeners. Maybe a grow illustrated book - like when to plant...etc? Your shop is already awesome but I'm always down for more prints. I love seeing artists creativity - so the more the merrier. Also postcards? I don't know it's hard to say cause I love your shop. More prints! I love yours. Truly love all your prints!! So I would say more prints!! I'm in South Africa so don't know if I can count as an entry, but want to say Congratulations! I get so much inspiration from yours and Ashley's lives and I love all your prints, you should definitely do some more prints, including some more garden/ veggie designs...something about chickens?... (maybe even a donut one haha) as well as more of the deep and encouraging ones. You have motivated me to scribble some lettering and I have found it very therapeutic for the season I have been in. Congratulations and keep bringing the Light and Hope you do through sharing your gift! Prints are my favorite, but keep it all coming. Your work is beautiful. I also #regramed on instagram as eclectice. I love your shop and your prints! :) as for ideas- maybe some animal prints? Bear? Fox? With some kind of quotes about being brave? I am always happy to see more prints, your work is amazing! I also shared on Instagram! I hope I win but even if I don't, thank you for what you do and for being willing to share with all of us! I really enjoy all your creative talent, but maybe more print at home options ... like note cards, tags, etc. Happy day!! I shared on my FB page too! Notecards. Always notecards. Maybe "Thanks, So sorry, Thinking of your face"...etc. Shared the link on my Twitter feed. I'd love to see more cards in your shop....perhaps a little all occassion set. oh lesley, my friend. i truly hope i win this because i am living in a craft store DESERT here in hawaii. also, i only brought 8 (out of 50+) of my prints with me to hawaii, and of COURSE your "how big is your brave" print made the carefully curated list. i want journals in the shop please and thank you! More prints!! I've given your Jesus & coffee print to so many people. Everyone loves it...and it's my fave too. Congrats on four years! Love all your work, but would always love more prints! Congrats on your 4 years!! I'd love to see your transportation print brought back. I would love to see postcards or notepads! Also, thank you for sharing such wonderful designs with us; you are such an inspiration. I need a cute magnetic grocery list for my fridge! =) I've been obsessed with sketching lettering lately, so I went back and read your blog post about what you use; I'm going to try that sharpie pen! I would love to see more cards, birthday, anniversary, thank you's, etc. I especially would love some with Bible verses. Thank you for the giveaway...and happy 4th birthday to your shop!! I would love to see more prints!! Love your prints & cards! Yay 4 years! Love your prints. I can't wait for the "Honey" print you are working on to make it into the shop. That is a favorite verse of mine and it looks absolutely lovely! Ooh what a creative way to celebrate a fabulous milestone! Happy 4th! My favourite thing I've bought from your shop is my 2014 calendar, which incidently I still have up because I just love it! Thanks for making gorgeous art that brightens the walls of my little house, encourages my faith and makes me smile. I'm such a sucker for cards - more please! I wish I could buy framed prints so I could send them as complete gifts to friends without having to ship the print to me and then the gift to them! The white Ikea frames would be great and not too expensive! I would love to see more prints and cards so I can share even more of the beauty! :) Love your work!! Mini cards and prints would be fun! I love the small prints, I have several frames that I like to change whenever the mood takes. And they are easy for mailing to friends/family. Thanks for the chance to win this awesome bundle of goodies. I love your artwork and I'm insanely jealous of the climate you live in and love when you post sunny garden photos...my garden is covered in snow and ice! Your prints are awesome...more prints! Thanks for sharing!!! I would love to see some postcard sized prints. Congratulations on all your success!! More stationary! Or Scripture prints! I know it's not something you've done before, but I think digital prints would be really fun. Especially for people (like me) who need a last-minute gift and don't think enough ahead to plan for shipping time. What a fun giveaway! Your scripture prints are incredible -- I could always look at more of those! postcards and cards- I'm hoping to send more handwritten letters this year. What could be better than a hand written note on a "recipeforcrazy" card? Would love more note cards! I would love to see mini post cards added to your shop! I would love to see some small cards and lined journals for sermon notes!! I am really bummed that I will miss your class this weekend in Mnpls! Will you come back sometime or better yet you should come to Fargo, ND!! What would be awesome to see is another mini desk calendar but with a farm/garden/floral theme. Maybe for next year!…? Just my two cents :) thanks for the inspiration! More scripture prints and cards!! I shared about this on my Instagram...@mamajhersh. Veggie garden prints and thank you cards. I would love to see more notebooks and possibly even a planner if that's something you'd be interested in! I'd love to see more prints! I love every print I've gotten from you, so the more the better! Love your work and thanks for the giveaway!